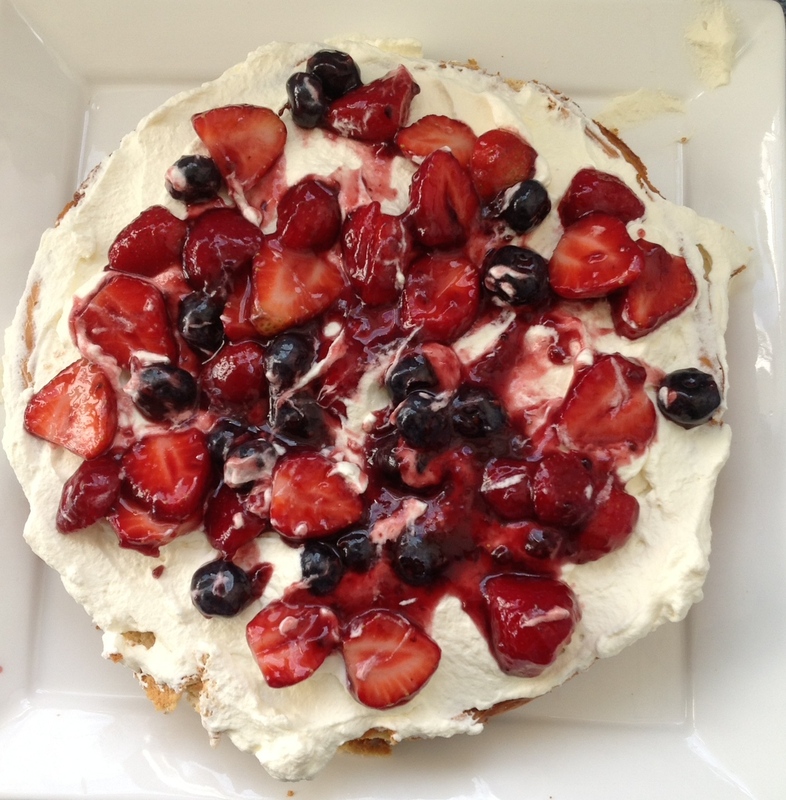 Simply scrumptious and perfectly themed for the 4th July with strawberries, blueberries and cream. This was the first dessert I made after I stopped eating grains, seed oils, processed food and cut my refined sugar intake. It was the first dessert I have eaten without that guilty feeling of overindulgence, or triggering that familiar craving of “just one more slice”! Full of lovely full fat cream cheese and sour cream with a delicious coconut and almond base.This is the ultimate paleo with cream recipe, so apologies to all who are dairy-free. It is so scrumptious that it is regularly requested as a family treat! So give it a try, I am sure you will love it too! 1 cup Fresh strawberries and blueberries to serve – you can use thawed frozen berries just omit the berry jam. 2 tbsps berry jam to glaze. Line the base of a 20cm/8in springform pan with parchment or baking paper and grease the sides of the pan. Place jam/jelly in a pan and melt over a low gentle heat, stirring until warm and runny. Set aside to cool. Reserve 2 tbsps to use as a glaze. Put all the base ingredients into a food processor and wiz until well combined and mixture resembles crumbs. Spoon the mix into the lined pan and evenly distribute across the base, pressing firmly with your fingers to make sure it is flat and even. Place in the fridge until needed. Beat the coconut sugar, (honey or maple syrup) and cream cheese until smooth. Add eggs, one at a time, beating in each egg well. Stir in the vanilla and sour cream and mix until smooth. Pour ½ the jam/jelly over the base and smooth. Gently tip the cream cheese mix over the top of this. Dollop spoonful’s of the remaining jam/jelly over this and swirl for effect. Alternatively you can put all the jam/jelly on the base and keep the cream cheese mix clean. Bake for 1 hour – check after 50 mins – it should be set on top. You can also check with a skewer (its done if it comes out clean). Remove from the oven and leave to cool for an hour then place in the fridge for at least 2 hours. When ready to serve, carefully remove the sides of the pan, then gently take of the base and parchment/baking paper. Place on a serving plate. Spread the whipped cream over the top of the cake. Decorate with sliced berries and drizzle the remaining jam (jelly) over the fruit. Stand back and admire your masterpiece before slicing and sharing. 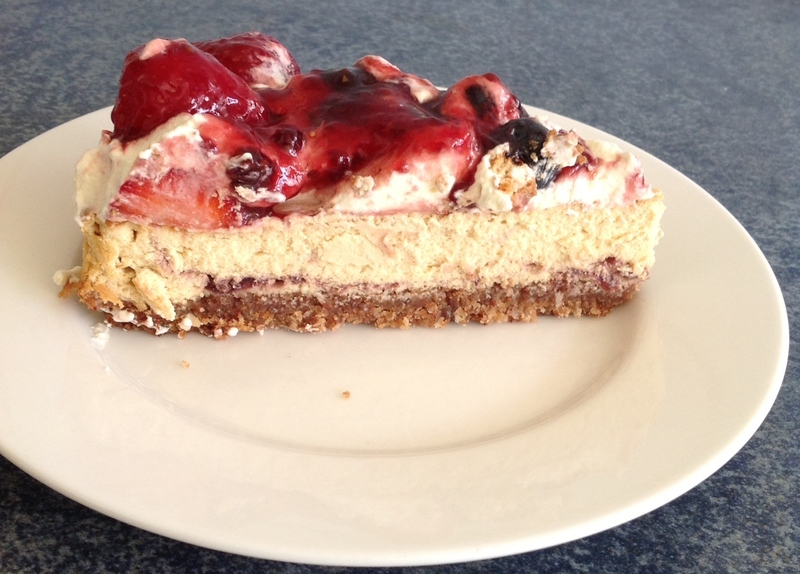 The recipe is an adaptation of a cheesecake from Bite Recipes it is an example of how you can clean up recipes to this way of eating.